Fiber Optic Lighting is inexpensive as well as dramatic for any home. 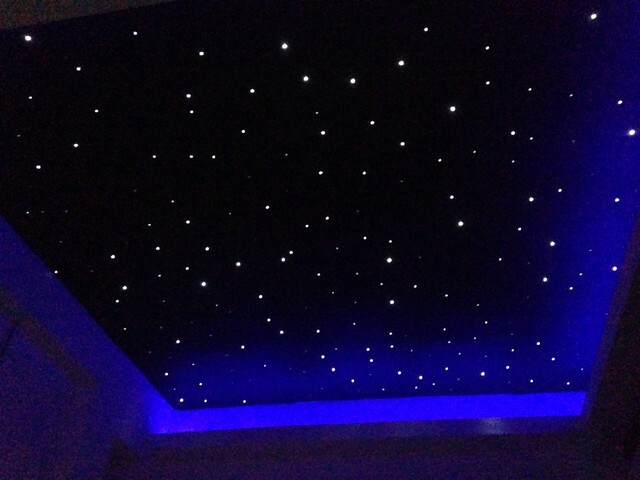 Fiber Optic Lighting – Twilight star ceiling tiles are inexpensive to install in your Home Theatre. Plano Texas Handyman offers both fiber-optic custom ceilings as well as fiber-optic panel installations. Our plug-and-play Panel Systems make our systems easy as well, bringing high-end star ceiling experience within reach for home theaters and other environments. For new construction environments, we offer a custom fiber-optic ceiling design completely hidden. With premium acoustic materials and our exclusive LED technology, Twilight star panels offers the best quality for the best value. And as a result of the Exclusive Patented Design and Technology, our lighting effects mimic the random glimmer of the night sky unlike any system on the market. Our standard Surface Mount Panels are produced with 1” fiberglass. Each panel is wrapped in standard midnight black fabric. Each panel will have 7-12 stars per square foot and dimension is created with light intensity from the LED light engine. The digital LED Light source draws only 2.3 W and is easily “daisy chained” to other panels for simple and worry free wiring. A 350W power supply will power up to 120 panels. Custom sizes and applications are available. Our Star Panel Kits are special order and may take up to 4-6 weeks for delivery. Please call if you need to have your panels sooner and we will see if that is a possibility.